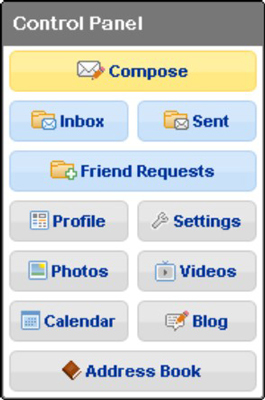 1Log in to your MySpace account. Your profile’s main page appears. 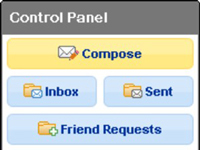 2On the main page of your profile, click the Settings button in the Control Panel. The Control Panel is on the left side of the screen under your picture. 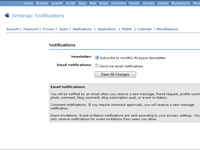 3In the Settings: Account window that opens, click the Notifications link. The Settings: Notifications window opens. 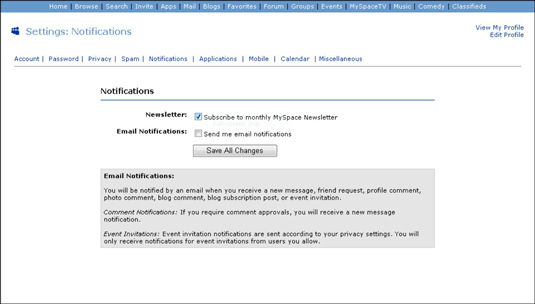 4In the Settings: Notifications window, check the boxes if you want to be notified about monthly MySpace events and/or receive e-mail notifications. When things start moving on your profile, you’ll get all kinds of e-mails telling you what other people are saying to (and about) you.